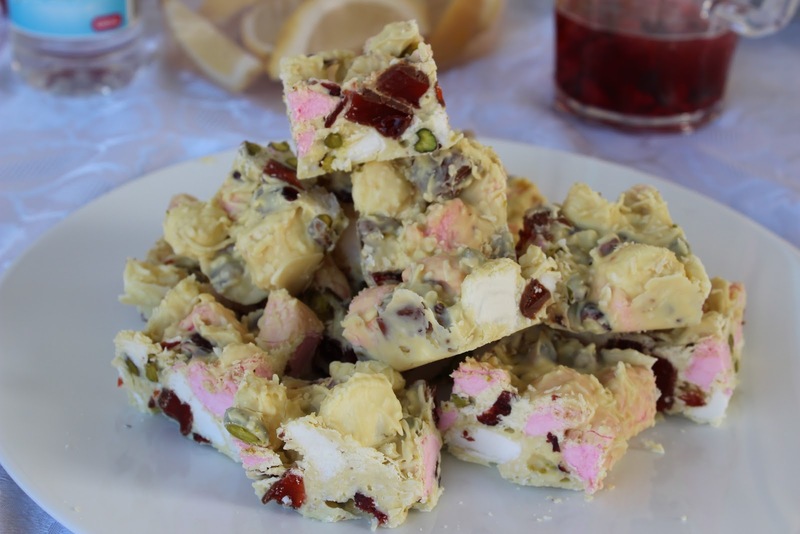 Oh my goodness there is nothing not to love about Rocky road, it combines some of my favourite flavours into one easy to make, ugly but delicious treat. In the festive sprit I thought I would make some as a special treat for after Christmas lunch. Mr Domestic will be away for work over Christmas so we are celebrating early this year so my darling doesn't have to miss out on all the fun. While you have got your chocolate melting away, combine all your other ingredients into a bowl. Add in your chocolate and stir to combine. Pour into the lined tray and leave in the fridge to set for at least an hour. When set you can cut it with a hot knife into nice little portions to either wrap up as a cute little pressie or serve up on a nice plate to your friends and family. In my previous life before being a mummy, wife, office worker, general domestic darling I was actually a beauty therapist sometimes make-up artist. Often in my job I was asked by my clients "what do you use?” It’s a good question really as I have been lucky enough to try a whole lota goodies and the benefit of seeing firsthand what works and what totally doesn't. So in the spirit of the festive season I will share some great beauty finds with you, some very obvious, some not so much. SPF - The cheapest best cream investment you can ever make. Seriously use it every day. You can either use it in a foundation if you are a religious make up wearer or a regular or tinted moisturiser if you don’t like the feel of regular sunscreen. Just remember that every time you walk outside, stand near a window, drive in the car you are exposing your skin to all those cancer causing, premature aging, skin thickening and pigmenting rays. Get the message? Ok good. P.S don’t forget to think about your chest and neck too ladies (and gentlemen) they need some SPF love too! Water - Another totally obvious one is to make sure you are drinking lots of water (tea, coke or fruit drinks don’t count here) the skin is a good indication of inner health and if you are not drinking enough water, your skin can look sallow, dry and probably spotty from the build up of toxins in your poor body. Exfoliation - A good quality AHA exfoliant- AHA stands for alpha hydroxy acid. Sounds scary and painful but it’s totally not. If you want that gorgeous soft baby faced skin, this is what you need to use. The exfoliant helps to remove the old dead layer of skin, get rid of blockages that cause spots and blackheads. If you need any more convincing, there is evidence to suggest that regular exfoliation actually helps prevent the occurrence of skin cancers! Treatment serum or treatment cream for your skin type - This can be a bit pricey sorry but totally worth it for giving your skin the boost it needs. Personally I use Ultra C Facial Cream 23% by Ultraceuticals and it is awesome for a drier skin type. I like something that helps to hydrate my skin, help refine the texture and give that nice glowy effect so this is perfect for me. If you have an oily skin, you probably want to look at something for helping control shine, keep oil production under control and help keep your skin clear of spot causing blockages. Skin Illuminator - If you don’t have this in your make up kit, you should. 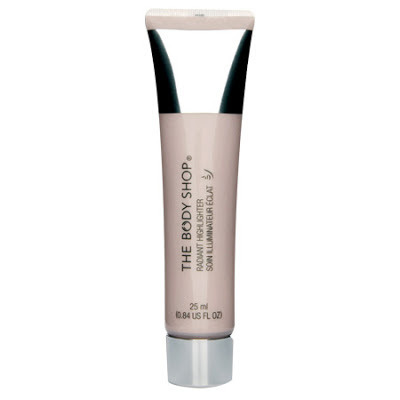 I love the Radiant Highlighter by the body shop, particularly because it’s a pretty good price and isn't sparkly like a lot of others I have found. For daytime use, I like to add a little to my foundation to lighten up the coverage and give that gorgeous dewy skin effect. 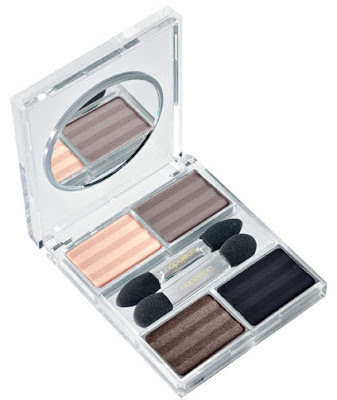 You can use it to highlight your cheek and brow bones too but just go easy here as you don’t want to look too shiny! This was actually recommended to me by a very clever makeup artist about four years ago to use on brides who want something long lasting but natural looking (and kiss proof). 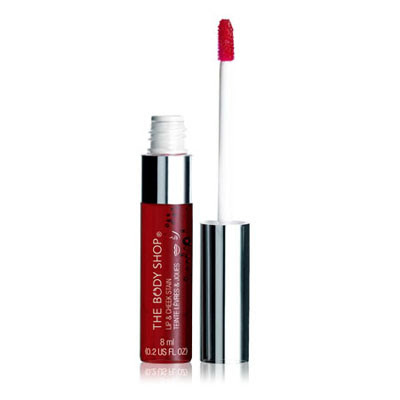 Perfect if you want to liven up your lips without looking "done up" during the day. Mascara - What woman doesn't love good mascara? 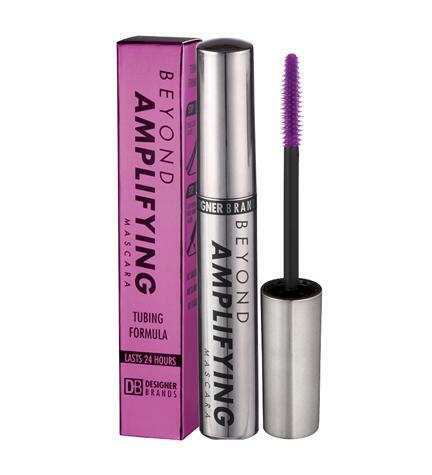 I can't take credit for spotting this one either as an old beauty school friend posted this one on her pintrest board (Thanks Emma :) ) Beyond Amplifying Mascara by Designer brands. This is awesome for those who like me end up with black panda eyes after a few hours of wearing regular or water proof mascara, the best bit is that it comes off like a dream in little black tubes with only warm water when you want to take it off ahhhhh. A matte pinky cream, a matte cool tone taupe, a shimmery cool tone bronze, a matte almost black chocolate. If you are on a budget, please don't let it put you off trying something like this or another quality make up brand, what you spend you get back in good colour lay down (when the colour actually shows up on your eyes) and something that will actually last the day or night rather than fading away to nothing. Now I am on a roll, I could probably bang on for another couple of hours about beauty must haves but we will leave it here for now so as not to wear you out and these really are my top basics minus fake tan, foundation and blush, but we can leave those for another day. Is there something you think I have missed or a recommendation you have? Make sure you leave a comment and share the love! It's coming into summer in Perth and its getting hot, really hot. 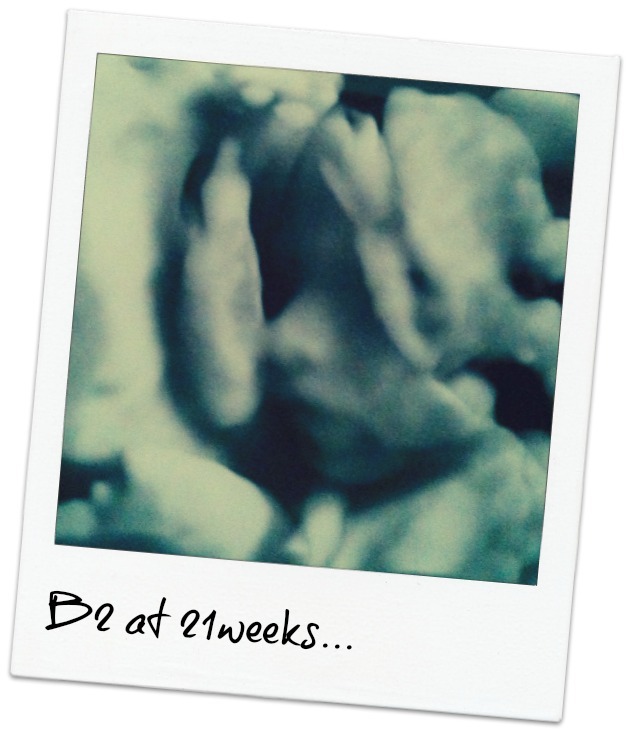 Being pregnant at this time of year really is a terrible idea. I think it's about time I get into my $12 maternity shorts and enjoy the sunshine! Yup I said $12 maternity shorts, if you are going to recycle an old pair or get some from the op shop yours will probably cost less. For the hour it took me to make my version, I think the $78 was well saved don’t you agree? Pair of shorts either buy a cheapy pair or recycle some you already have. 1 piece of stretch knit 20 inch x the diameter of your shorts minus 1 inch - You could recycle an old stretchy t-shirt here but I like something sturdier so used a cotton lycra blend I bought from the fabric shop. First off you need to remove the zipper as you won’t be needing this (plus your sewing machine needle wont like sewing over a metal zipper!) 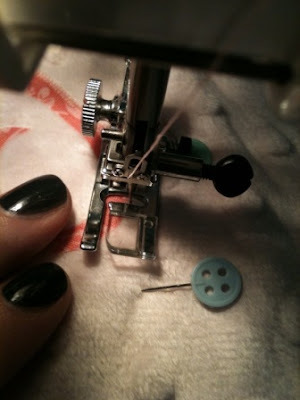 using a seam ripper. 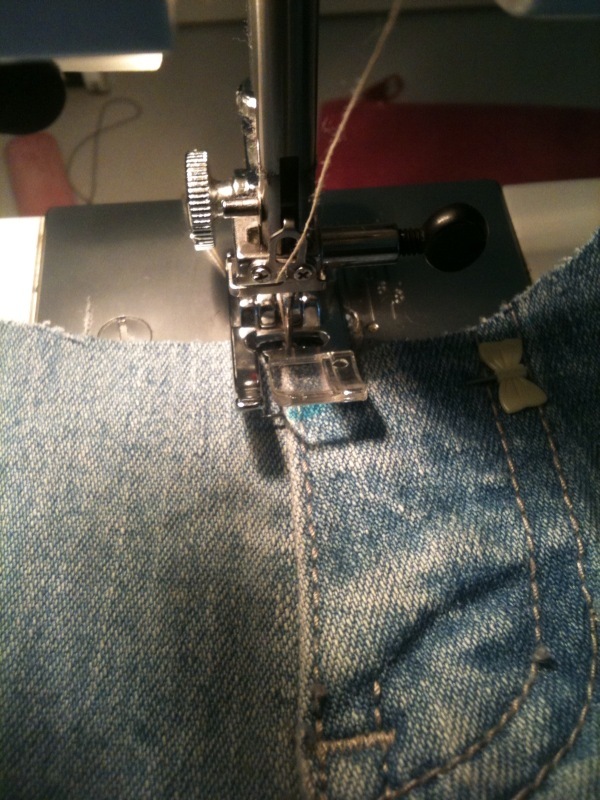 Try to keep from unpicking the decorative fly stitching so they still keep the look of a pair of denim shorts. Unpick the belt loops at the back too as you won’t need these! Try your shorts on to work out how low you need to cut the centre point so they are comfortable. This will depend on how you tend to carry and how high a rise your shorts have! Mark the point on the fly with a pin or marker. 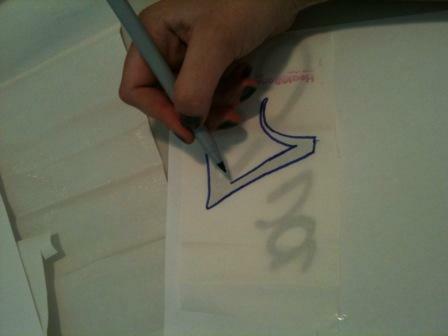 Draw with a marker a faint curved line from the low point you marked on the fly to the base of the waistband. Cut along this line and follow along the bottom edge of your waistband at the back. 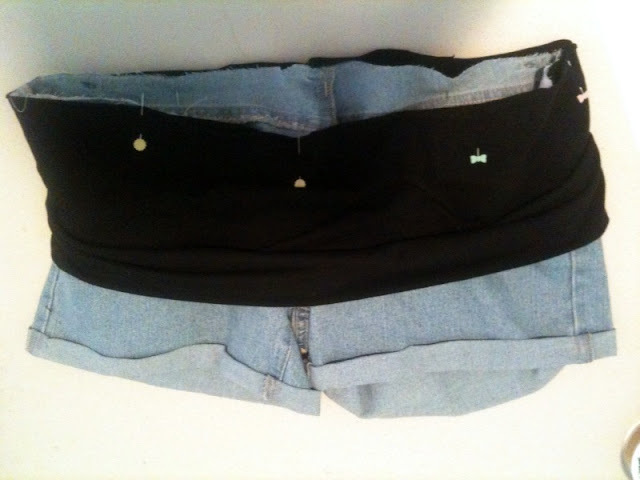 Cut a 20inch x the diameter of the shorts new waistband (minus 1 inch) rectangle of stretchy knit fabric. Fold in 1/2 with the short ends together and sew your seam to make a band. Fold in 1/2 again with the raw edges together and seams facing inside so you end up with a 10 inch wide band. 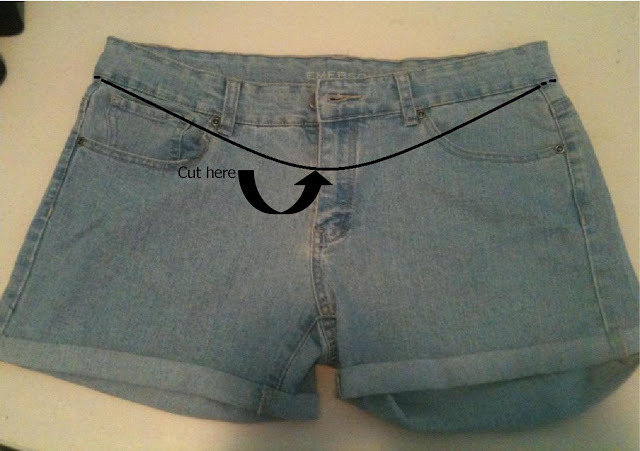 Pin the tube to your shorts by lining up the 1/4 marks first with the front back and side seams of your shorts. You may need to stretch the tube a little in-between these marks to get it to fit nicely. Zigzag or overlock the seams together. Get out in the sunshine in your new shorts! Just think about it, you wouldn’t try eating soup with a fork would you?! As summer comes around again, this is one classic Aussie desert you cannot go past for family BBQs and celebrations. This is a pretty simple recipe that doesn't require a lot of different ingredients so it's worth giving a go. If you have never tried one before, buddy you are missing out! I've made this big so none of your guests have to miss out but you could 1/2 the recipe for a more modest creation. 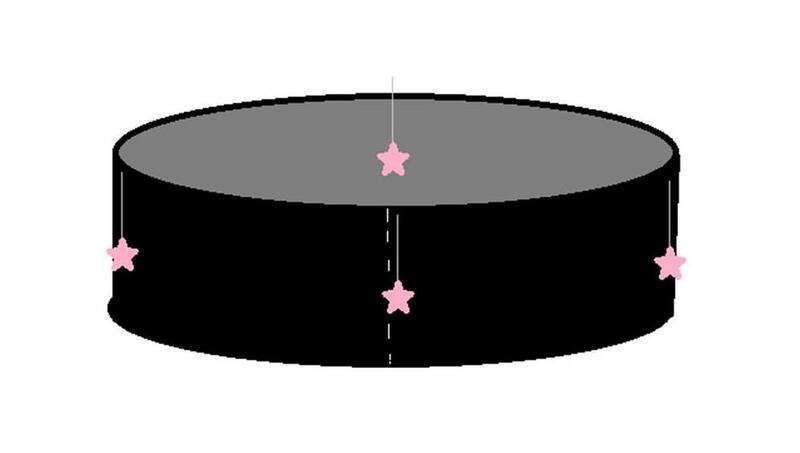 Trace a 25cm circle onto some baking paper, flip it over and line your oven tray with it. With the beaters still running start adding in the sugar a tablespoon at a time, making sure to catch any crystals on the sides of the bowl and scrape them down. Keep beating until you have a thick glossy white mixture with stiff peaks. Check that the sugar has been fully dissolved into the egg white by rubbing some of the mixture between your fingers; if it feels grainy turn the beaters back on for a few minutes until it feels smooth. If you go ahead and plop it on the tray all grainy it will get all weepy in the oven. Fold through the corn flour and vinegar gently until its fully incorporated. 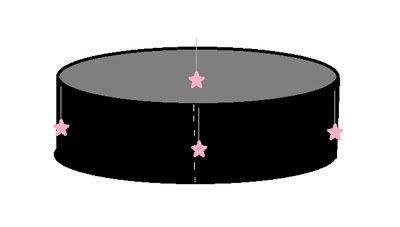 Using your traced circle as a guide, use a spatula to shape into a 25cm round. Bake for 2- 2 1/2 hours or until dry to the touch. Turn off oven and leave, with the door ajar, to cool completely. I like to make the pav the night before and leave it in the oven overnight to cool. Don't worry too much if your Pavlova drops or cracks a bit (mine always do) we can always cover it in cream later! When you are ready to serve, whip up the cream with vanilla and icing sugar and blob it on top, you can use it to fill in any shoddy cracks to :p and top with your fruit to serve. I love making them, looking for new recipes to try and of course eating them! Mr Domestic likes to tell people that I look at the desert menu first when we go out to dinner, if there is something that catches my eye I always order a small dinner so I have room. This is true so I won't deny it. Looking through a Home Beautiful Magazine I have the other day this tasty little number definitely caught my eye. As we are having a BBQ on Sunday to celebrate Grandpa P's birthday it only seemed right I should test it out. How tasty does this baby look! Refrigerate the base while you make the filling. 2. Melt the chocolate carefully so it's nice and smooth. You can try the traditional way in a glass bowl over simmering water, I find the microwave in short bursts quicker and easier. Set it aside to cool. 3. Sprinkle your powdered gelatine over 1/3 cup of boiled water and mix to dissolve, leave this to the side to cool. 4. In a separate bowl beat your cream cheese sugar and vanilla until pale creamy and smooth. Add in the cream and beat until combined and just starting to thicken. 5. Add in the white chocolate and cooled gelatine mixture and beat again until just combined. 6. Fill the biscuit base with your filling and place in the fridge to set for a few hours. I've made mine a day ahead so it's been chilling over night. ** don't forget to lick the bowl, the filling is delicious! 7. To make the syrup, combine the sugar, jam and water in a small saucepan over a med heat and stir to dissolve. Continue heating to a simmer and leave it alone for 8-10 mins until its thickened. (don’t worry if it still looks a bit runny as it will thicken further on standing). Cut the nectarines into thin slices and arrange on top of the tart and drizzle on the syrup just before serving. ** I would like to make an addendum to this recipe to note that everyone seemed to think that it was a cheesecake despite my insistence that it is a tart. It definitely has a cheesecakishness about it but is very very subtle and very delicious. Ok let's look at a few of my latest half jobs, hopefully that will give me a kick start again to finish them off. Kinda creepy all eyeless and naked don't you think? At least she's done her hair! See the good bit where I have started sanding? You know what? I'm feeling inspired already! 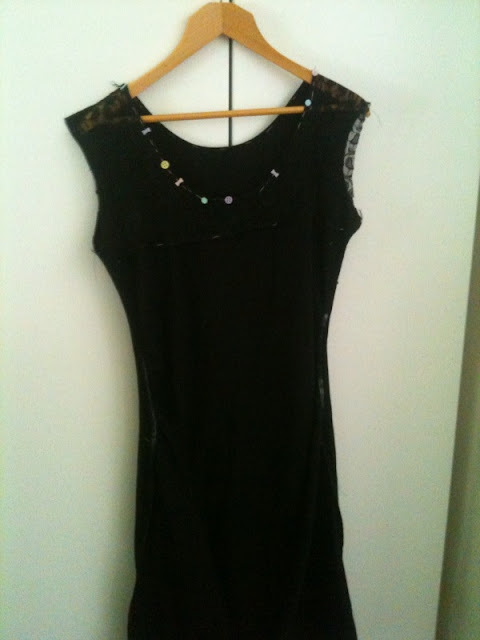 Apologies for the horrid photo here, I swear this dress looks much better on. The metal railing on our front veranda, wait I'm not counting that one as we got someone in to finish the job but I totally helped by painting on an excellent undercoat. Really I’m just skimming over the jobs I have started and not ever finished. If I were to get Mr Domestic to write the list it would definitely be a whole lot longer and much more brutal. Lucky for me I’m pretty sure he doesn't read this. I am fairly certain I am not alone here with piles of half jobs, how many do you have? A few days ago one of the lovely mamas in my mothers group had her second baby yay! If I wasn't already expecting my own I would be feeling very very clucky. 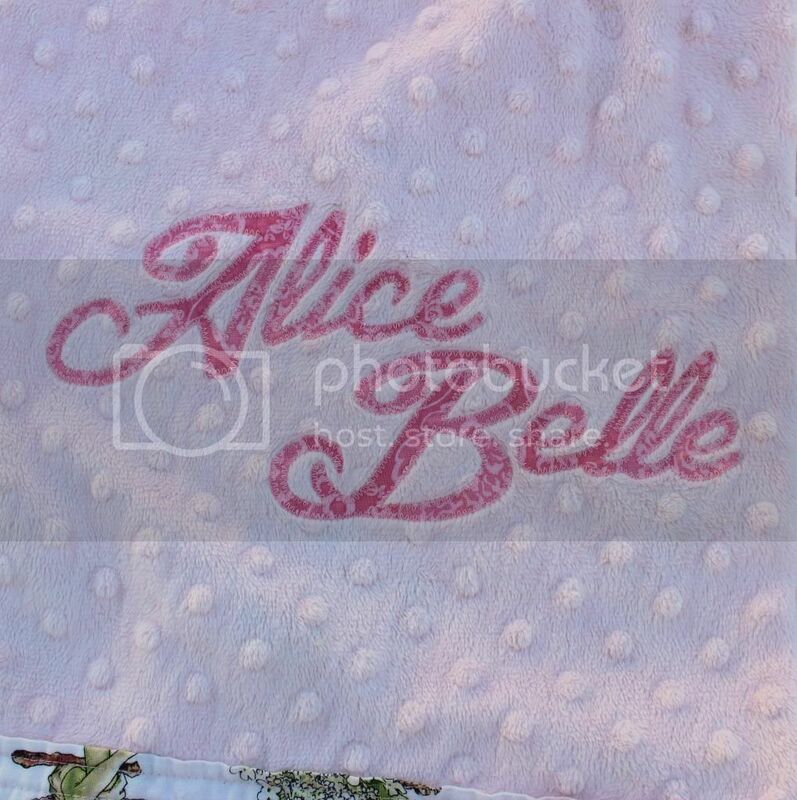 I wanted to do something special for this little one so I have made minky a self bound baby blanket, and just to be extra fancy appliquéd her name on. There a few tutorial versions of this blanket floating around the net right now but I'm biased and like mine the best as I think the binding finishes it off much nicer plus I should mention its super easy! 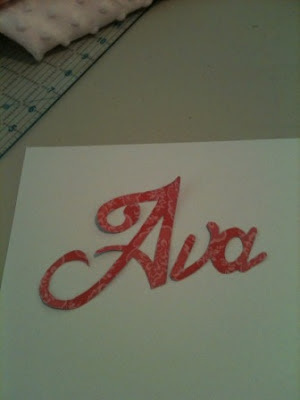 First things first, decide on a font you like that's nice and chunky (and easy to appliqué around) to type out the name. You can either pick one you like from word or just use google to find a free one you are happy with. 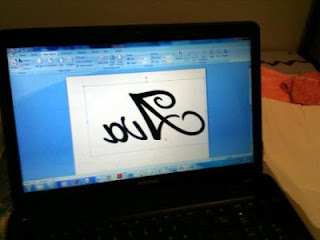 Type it up in word and do a quick copy and paste job into paint to flip it to a mirror image. Enlarge it to the size you want and print that sucker onto a sheet of paper. You could do all kinds of things to reverse it but I'm lazy and this is the easiest way I know how. Once it's printed you want to place the reversed image right side up and the heat and bond on top (glue side down btw) to trace the text. Then using your scissors cut it out all nice and neat like this..
Peel of the backing paper, position your transfers and iron it on following the heat and bond directions. Pin some interfacing on the back of your minky behind the transfer. 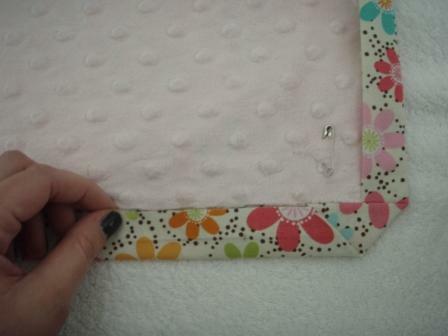 The interfacing just helps to stop the minky slipping around all over the shop and driving you crazy. 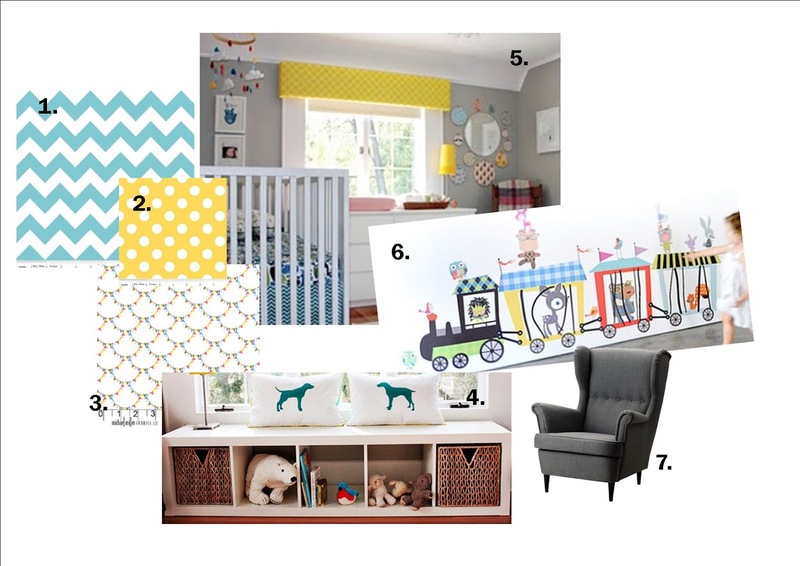 Yay it's looking cute already! Do yourself a favour and before you go all appliqué crazy, work out the ideal settings, tension, width etc on a couple of scrap pieces first. My machine is on regular zigzag 3 for tension, 3 for width and in between 0-1 for length but it may be different on your machine. You really want a nice neat zigzag that's nice and tight like this. I would really recommend using an open toe foot too if you have it as it will make the job easier, don't worry if you don't, you will just need to be extra careful. 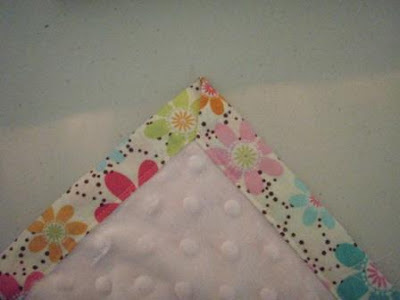 Starting halfway along a nice easy straight bit position your needle so the centre line lines up with the outside of your appliqué fabric. You are going to try to keep it lined up like this the whole way. Go slow, lift your foot and turn as necessary and whatever you do avoid the temptation to pull and stretch the appliqué into the right spot, just keep lifting that foot and moving it gently. Once you get back to the start run a few stitches over and back to keep it in place. Once you have done the appliqué, we can finally get onto putting it all together. 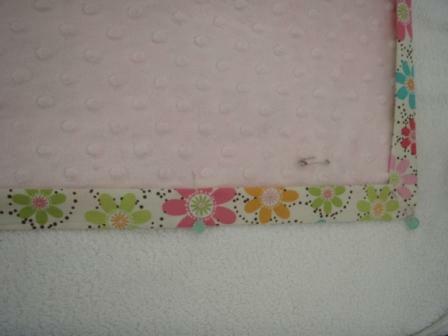 Place your cotton down first wrong side facing up and lay your minky right side facing up on top. You want to spend a bit of time here smoothing it all out so it's nice and neat. Using a ruler, manipulate the minky so it's got a 5cm cotton border on all sides. I like to cut my cotton now rather than earlier just to make the job easier. Oh and make sure you are pinning as you go to keep it all in place. 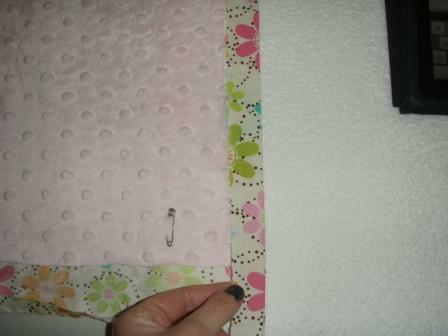 Press again to take it 2.5 cm over the minky edge and fold the corner like this. Now we are going to do the next side the same way, folding over once, pressing then folding again. Look how nice those corners are! Pin the corners and binding in place as you go so it stays put for sewing. 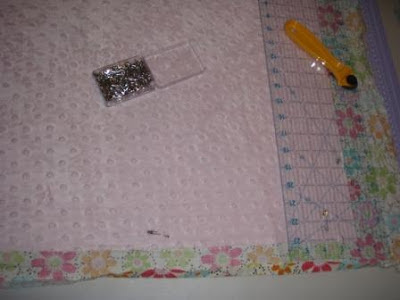 When you get to the last side, fold over the first side corner first before pressing, then we are all ready to sew. 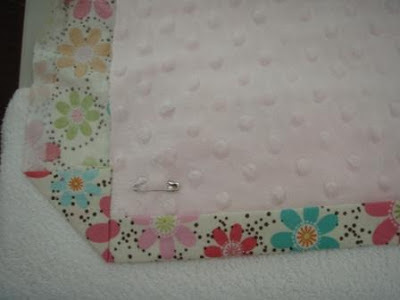 There are a few ways you can finish off, if your happy to hand sew you could use a ladder stitch to secure the binding, if not you can just machine sew it. 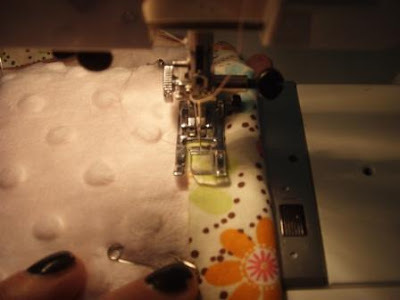 I'm going to machine sew mine as its nice and quick and will still look good. 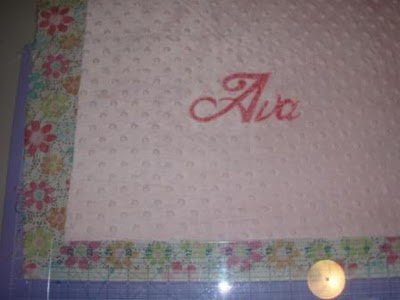 You will need to do a teeny bit of handsewing to finish up. See these bits? 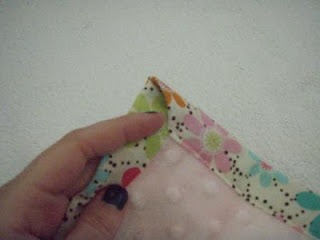 You need to do a ladder stitch to secure them down. Yay we are all done! 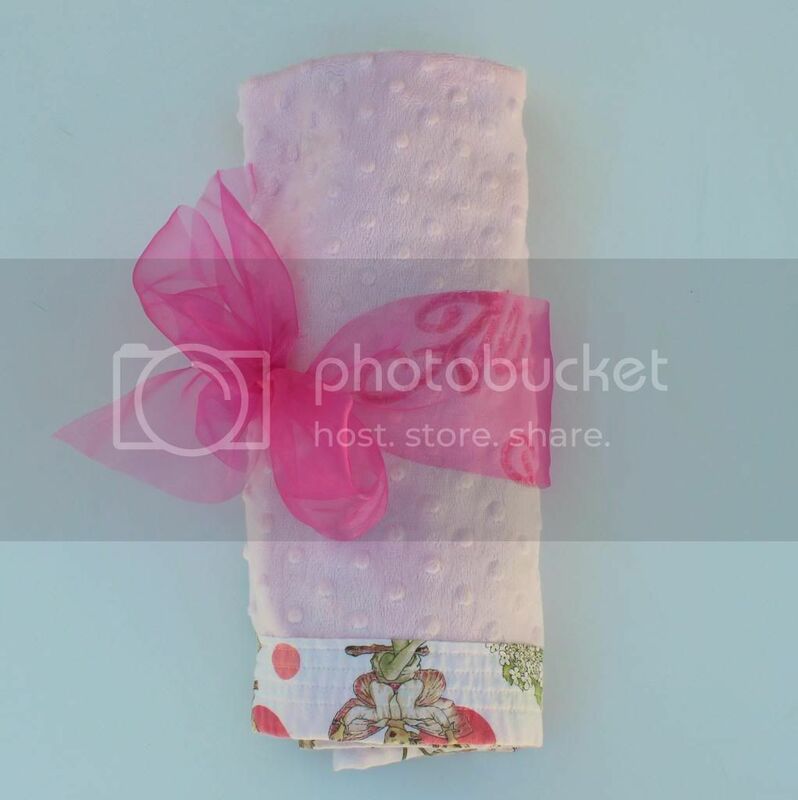 Fold it up nice and tie it up with some ribbon and the new mummy will love it! 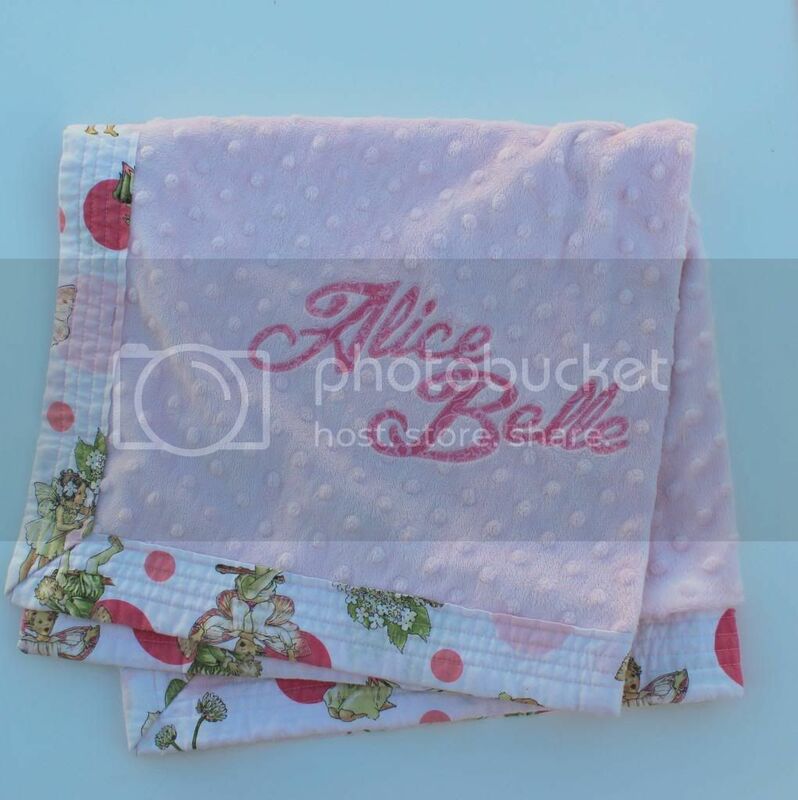 Now don't be shy please feel free to comment with your feedback or link your own versions of the baby blanket I would love to see them and I love comments!